You need the other piece. The kit is designed so you only remove the length of plastic equal to the length of the kit. idk why i am having so much trouble with this...the pic is what i have so far. I cut the top half of plastic to the length of which it was before when i tape it with the kit. Is this what I am suppose to do? And what do you recommend to get the on off switch wires through the hole after i put the entire assembly in? Never mind I finished it!! I figured it out, thank you for the quick replies i really appreciate it!! 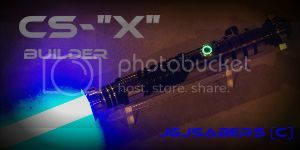 What size is the thumb screw on the top of the saber? I damaged the hole and it won't go it anymore so Im going to use a tap to re-make the hole. Wanted to thank you for this thread. Really helped me with my Vader conversion. when it shuts off does it do the "saber shutting off" sound? Is it possible to get a link to the images for the disassembly? I am about to start my own and could really benefit from the reference material. Thank you. So I have the 2015 Vader Black Series. Attempting a basic conversion. I followed the diagram in this thread exactly and bridged the pads on the sound board the same way, only when I wired everything up and tested it, the LED flickers for a second and both the LED and sound shuts off. I tested the bridge in a different position, the same way the 2015 Rey Jedi Training saber is set up, and I got nothing. Pads aren’t labeled. Is there a different possible place for the VDD pad to be located? I’m completely befuddled as to why it’s not working correctly. Any help would be appreciated. Last edited by Davemik239; 02-14-2018 at 11:59 PM.